Orem- Orem is one of the Indonesian food. 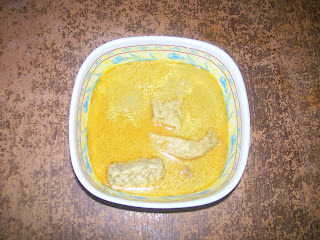 The Ingredients is the same like Chicken Curry, but Orem- orem use tempe and tofu, not chicken. The Cooking Guide is also the same like Chicken Curry. First, Cut tofu and tempe into several parts. Puree onion, garlic, hazelnut, turmeric, red chilli, salt and sugar. Heat 1 tablespoon oil, add the fine spices, and the last add tofu and tempe. Cook in ten minutes. Now Orem-Orem is ready to serve with warm rice.